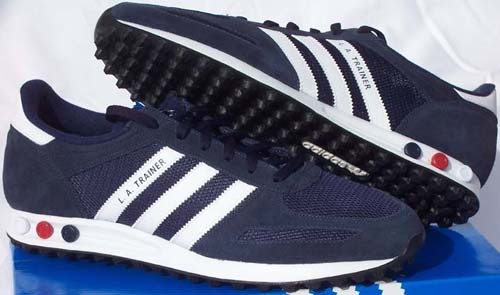 I just love all of Jays addidas trainers i just bought a new pair of addidas samba trainers in blue with the white stripes and as soon as i put them on they just make me smile Does anybody else own any cool looking addidas trainers? I just recently bought a nice pair of black-with-white-stripes Adidas 1609ER's. Not great for the winter, but they're very comfy, light and stylish. Love 'em! They have a very cool (and gigantic) Addidas store here in Irvine, CA. After wandering like a kid in a candy store for over an hour there recently, I bought a super cool pair of Addidas flip flops! They are the most comfortable flip flops I have ever worn in my life! They are like walking on a cloud! I know they're not trainers (sorry) ...but I just couldn't help myself. I didn't even know Addidas made flip flops! You learn something new everyday! yeah, I don't even really wear tennis shoes, I'm not training for anything. I'm always admire Jay's trainers. I went to an Adidas store few months ago and tried to find some cool sneakers but they're pretty expensive so I've changed my mind. Got 4 pairs. I don't really wear that much of sports clothing anymore but adidas footwear are a MUST! I only wear adidas. They are not just footwear, they are a symbol! Same here. Have one All Stars but still want to get Adidas.